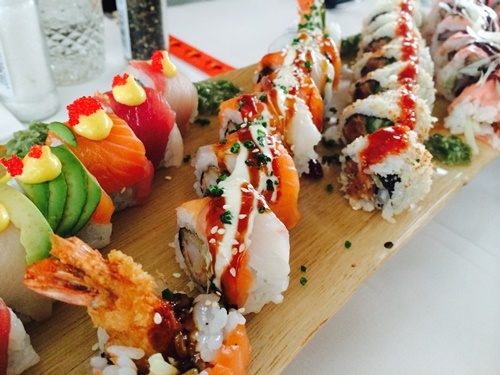 Think of Japanese food, and most people in the West think of sushi. And ever since I reviewed Yummie a few months ago, people keep suggesting new Amsterdam sushi restaurants I should be checking out. So I was pleased to be invited to The Oyster Club – a sushi and oyster restaurant that opened in the Olympic Stadium in 2013. But of course there’s more to Japanese cuisine than sushi, and I’ve not yet made it to Japan to learn about it first-hand… I’m thankful, then, for the opening of Le Fou Fow: formerly a pop-up at my favourite toko, Dun Yong, and now with a permanent location on the Elandsgracht. Le Fou Fow (does anyone know what the name means?) 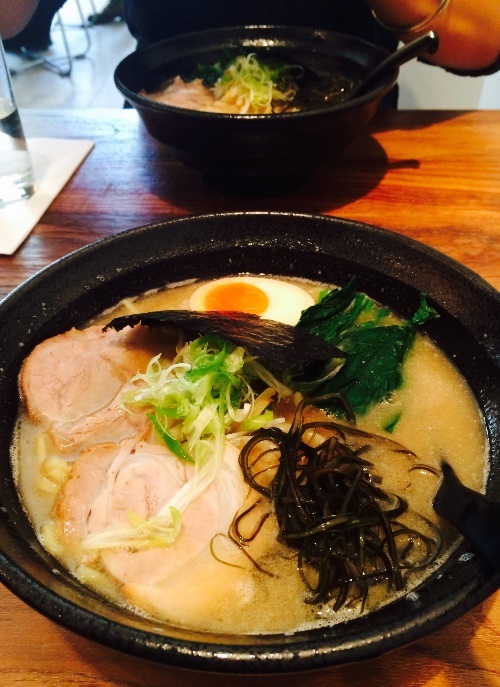 serves mostly ramen: steaming bowls of noodle soup in three sizes, with various different bases to their broths. Pig addict that I am, I chose the pork broth which was also served with (you’ve guessed it) more pork, noodles (the slightly flat variety with good bite), various types of seaweed (I’m no expert), and half a boiled egg (which was amazing in a Heston Blumenthal slow-cooked sort of way). We were warned that the pork broth had “a stronger flavour” than the regular chicken, vegetable or miso broths. Bring. It. On. I loved every spoonful of my bowl of soup – and it felt almost medicinal for the throat infection I’d been nursing the past few weeks. Be warned, however: Le Fou Fow has terrible acoustics (the table opposite us looked like a group of colleagues celebrating – we could barely hear ourselves think) and the price tag is steep for the style of restaurant. You’re looking at around €10-15 for the ramen itself (which isn’t unreasonable), but a simple pot of tea costs €3.50 and a small portion of gyoza €6. Meanwhile, at the other end of the spectrum – in terms of price, location and style – is The Oyster Club. Not technically Japanese (and not pretending to be, either) it does, however, serve some of the most creative sushi I’ve eaten in Amsterdam. I was invited to a press lunch there (which means that I didn’t pay – note to reader!) and we were treated to a colourful selection of fishy masterpieces. Afterwards, I had a chance to talk to the sushi chef and take a look at the seafood in its ice-lined display cases. Like I said, I’m no expert when it comes to Japanese food, but it all looked like the real deal. 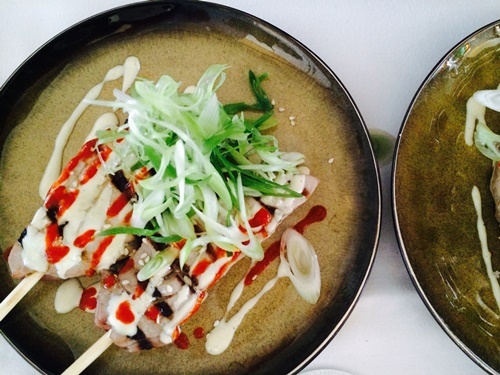 The dishes that followed were less Japanese, more Asian-fusion. They included seared tuna skewers with wasabi and sriracha dressings, deconstructed Peking duck pancakes, and fried prawns with curried mayonnaise. The tuna skewers, just like the spicy tuna maki rolls, were delicious. I was less convinced about the wisdom of deconstructing a duck pancake, and nor was I a fan of the too-greasy fried prawns – but never look a gift horse in the mouth, eh? 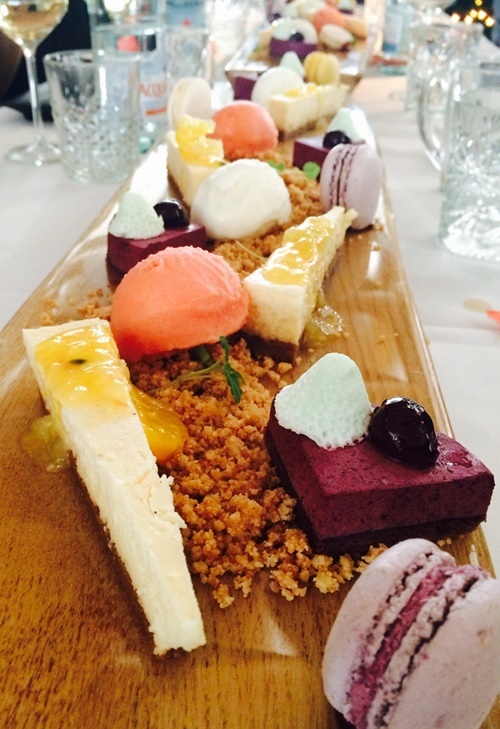 Dessert was a veritable painter’s palate of gorgeous fruity colours… We tried yuzu cheesecake, yoghurt ice cream, cherry mousse cake, blood-orange sorbet and beautiful violet macarons. Some I liked more than others, but that’s only to be expected when trying a fixed selection rather than ordering for yourself. In any case, this is literally one of my favourite food photos I’ve ever taken. The most colourful dessert medley I’ve ever had the privilege of photographing! It’s hard to say how much lunch would’ve cost had I been paying, but suffice to say it wouldn’t have been cheap. According to The Oyster Club’s menu, eight pieces of sushi come in at around €16-22, sharing plates (like the tuna skewers in the photo) are €13-17, mains start at €22 and go up to €45, and desserts are €8-10. Then again, its location near the Zuid As probably means its clientele can afford it… And as for the rest of us, I’ll be back for some more luxury sushi next time I get paid.